Heading out to 7-Eleven? 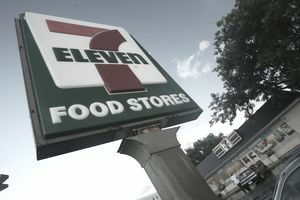 Before you go, check out this list of 7-Eleven freebies and find out how you can get free food and drinks, Slurpees, and even free Redbox rentals at your local 7-Eleven. 7-Eleven has a rewards program called 7Rewards where you can use the 7-Eleven app (available for iOS and Android) to collect points for your purchases and use them to get rewards for free stuff like food, drinks, and more. It's a great rewards program that's available at all 7-Eleven locations in the U.S.
Not in the U.S.? If you're in Canada you can sign up for the 7Rewards program too. Just for signing up for 7Rewards, you'll get 800 points which you can use to redeem for a Big Gulp drink, medium hot coffee or beverage, Slurpee, cold brew coffee, or a rotating selection of snacks. You can save up your reward points to the 800, 1,200, 1,500, or 2,000 point level. Each point level gets you better rewards. With 800 points you can free food like donuts, cookies, granola bars, pizza and free drinks like Big Gulps, coffee, and Slurpees. 1,200 point level will get you items like a free candy bar, chips, bottle of soda, and hot dogs., 1,500 points will get you some free premium snacks, bakery items, and nachos. At the 2,000 point level, you can get free lunch items like sandwiches or salads, a bag of beef jerky, a whole pizza, and more. These rewards change often so be sure to check the website or app to see what you can redeem them for. They are under the Rewards Menu section of the app. You can redeem these rewards by simply loading them onto your app and then scanning the app barcode when you checkout. The amount of the reward item will be deducted from your total. You can earn more points from scanning your app when you check out at 7-Eleven. You'll get 10 points for each $1 you spend. There are also bonus points available when you purchase certain items at 7-Eleven. You can view them under the Bonus Points section of the app. They are already loaded into your reward program so you'll get the points when you scan your app barcode. The bonus point offers change frequently, but I've seen bonus points available for purchases on taquitos, bottled drinks, chips, nachos, beef jerky, big gulps, energy drinks, juice, gum and mints, over the counter medicine, bakery items, and coffee. Coupons for certain items are also available as part of the 7Rewards app and these also change frequently. Some are available in limited quantities so you'll want to be quick to use any that you're interested in. These will get you money off your purchase. I've seen coupons available for drinks, chips, cookies, pizza, and over the counter medicine before. A virtual punch card is also available as part of the app, allowing you to get one free 7-Eleven hot drink, iced coffee, Big Gulp, Gulp cold drink, or Slurpee drink of any size for every six drinks that you buy. Every summer on July 11th, 7-Eleven celebrates Free Slurpee Day by giving customers a small Slurpee in any available flavor. Many 7-Eleven's have Redbox kiosks outside and there are lots of codes available that will get you free Redbox movies and games rentals. Here's a list of free Redbox codes that you can use at 7-Eleven. Also, keep your eyes open for 7-Eleven specific Redbox promotions that may appear on signs on the Redbox kiosk or on your receipt.